Grooming a dog is serious business. Today, there are many professional grooming centers available to choose from. Offering a wide range of services at fairly competitive rates, these centers are ideal for people with whom money is not an issue. While grooming done professionally does usually tend to have somewhat more aesthetic appeal, grooming of a dog can easily be done at home as well. Bathing. A bath once every three months suffices for most dogs. More frequent and aggressive bathing can strip the dog coat of its natural oils, making the dog susceptible to infections. Brushing. While dogs with short hair require brushing just once a week, dogs with longer hair might need to be brushed more often. As per the dog breed, brushes can be selected from slicker brushes, pin brushes, and bristle brush. Eyes. Careful scrutiny of the eyes is done while grooming. Signs to look out for are tearing, bulging, redness in the cornea or inner eyelids. Teeth. Proper cleaning of the teeth of your dog is also essential. Teeth can be cleaned using toothpaste, baking soda or water. Ears. The area in and around the ears is a favorite haunt for ticks and fleas. Clean the ears carefully with the help of cotton wool. Paws and Nails. Trim the excess hair near paws. Also, clip the nails to their proper length. If you decide to give your dog a haircut at home, look for a clipper most appropriate for your dog’s breed, size, and coat type. You can, as per your own preference and convenience, select either the battery-operated one or the plug and use option. Before you decide to give your dog a haircut, you must understand the basic difference between a trimmer and a clipper. While a clipper is used to cut longer hair, a trimmer is mostly used for styling and designing. Full & Fluffy. With only a minimal amount of trimming involved, this haircut is closest to the natural look of the Poms. In this haircut, the coat is brushed upwards for a fluffier and fuller look. The Lion Cut. 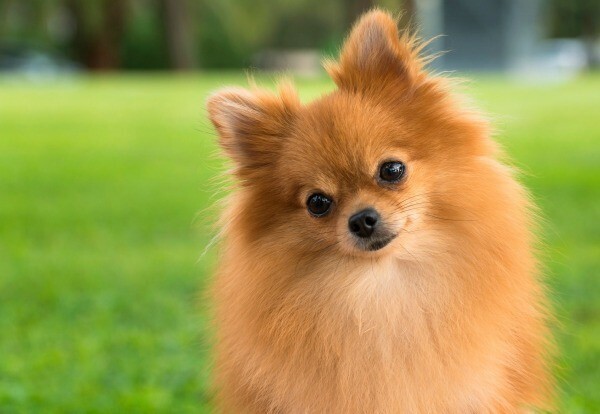 As the name suggest, this haircut makes a Pom resemble a lion. While the hair at the head and neck is left to grow long, hair elsewhere is cut short. For many pet parents of Poms, the Lion Cut is especially favored for hot summers. Requiring comparatively lesser amount of grooming, the Lion Cut is a hassle-free summer haircut for Poms. The Puppy / Teddy Bear Cut. In this particular haircut, the entire coat of the Pom is clipped to a uniform length. Often, the hair on the head is left a little longer than the rest of the body, giving the head a fuller and teddy bear look. The Puppy Cut or Teddy Bear cut is also quite popular for summer. 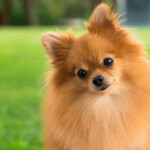 Pomeranians, known for their fluffiness, are generally considered to look their best when their natural look is retained. The Full & Fluffy comes closest to the au naturel look. However, in the summertime, the Lion Cut and the Puppy or Teddy Bear cut are more popular.